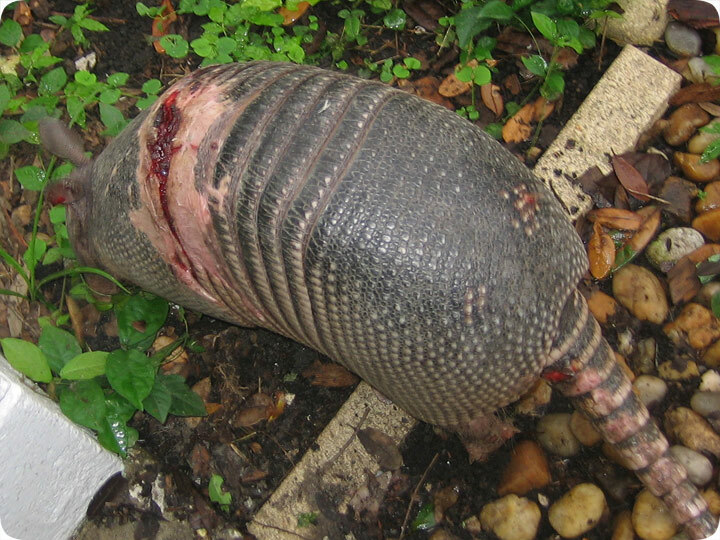 07.15.2005 - I caught this armadillo, and it had a large wound on its back. The injury looked fairly fresh. I do not know what caused this. Armadillos don't really have any significant predators in the United States. I doubt that this was the work of another animal, such as a coyote or dog. Most likely, this was the result of a collision with a car. Why then, the big cut on the back instead of flattening tiremarks? Because armadillos tend to jump when startled, so perhaps a car passed over the armadillo and it jumped up into the undercarriage of the car and got this injury. Or maybe it was run over by a low-rider vehicle. Of course, it could have been a number of potential sources. Whatever the case, the animal actually seemed fine. It could run around just like any other armadillo. They're tough critters. I suspect that this will heal. Armadillos are common in both Florida and Texas. If you need Florida or Texas armadillo control, click on my link of nationwide trappers for a pro in your area, or browse my site for more trapping tips. Armadillo Control In The South - One of the biggest pest animals in the south of the USA and Texas is the armadillo, and this small armored creature can often be a health hazard and cause damage in many yards and gardens. This is why many people will turn to an animal control service to try and deal with their armadillo problem, and there are some experienced armadillo catchers who can help to get rid of the problem. Depending on the laws in your state, these animal removal professionals will be able to catch the offending animal and then either release it or kill it humanely depending on local regulations. Southern states are usually more severely affected by armadillos as they offer more suitable conditions for these animals that prefer warmer climates and particularly prefer woodland and marshy areas. However, the armadillo population has expanded so much that there are more of these animals coming in to contact with people, and causing them to look for help. There are many people who may expect their local government agency to actually deal with all of the pest animals, but the reality is that most states don?t have the budgets to deal with such animals, meaning that a professional animal control officer is the best option.